Taken from Roger Daltrey's autobiography 'Thanks A Lot Mr Kibblewhite: My Story' that is out now and available in all good stores. On June 30, 2015, we played at the Zenith in Pans. We'd just headlined Hyde Park and Glastonbury and, for the first time that year, I felt like I was back. That night in Paris felt fabulous but it was hotter than a blacksmiths forge, it must have been more than a hundred degrees Fahrenheit outside but inside the Zenith there were SIX thousand people. That's six thousand one-bar electric heaters. The gig was great, really fluid, but when I came offstage I was completely drained. 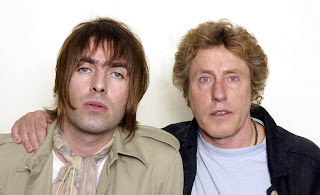 I remember Liam Gallagher came backstage to say hello afterward. I love Liam. He's one of the last few bastions of old-school rock. He'd be the last one in the trenches with you, always, and he'd carry you out. That night, in that boiling heat, he was still wearing his parka. Ridiculous - but it was great to see him.